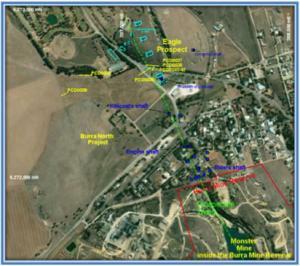 The Burra project is situated 150 km north of Adelaide within the Adelaide Geosyncline, 800m to the north-west of the historic Monster Mine on the outskirts of Burra. The reserve under the Mining Act remains in place over and in the near vicinity of the Monster Mine as shown in red on the map below. 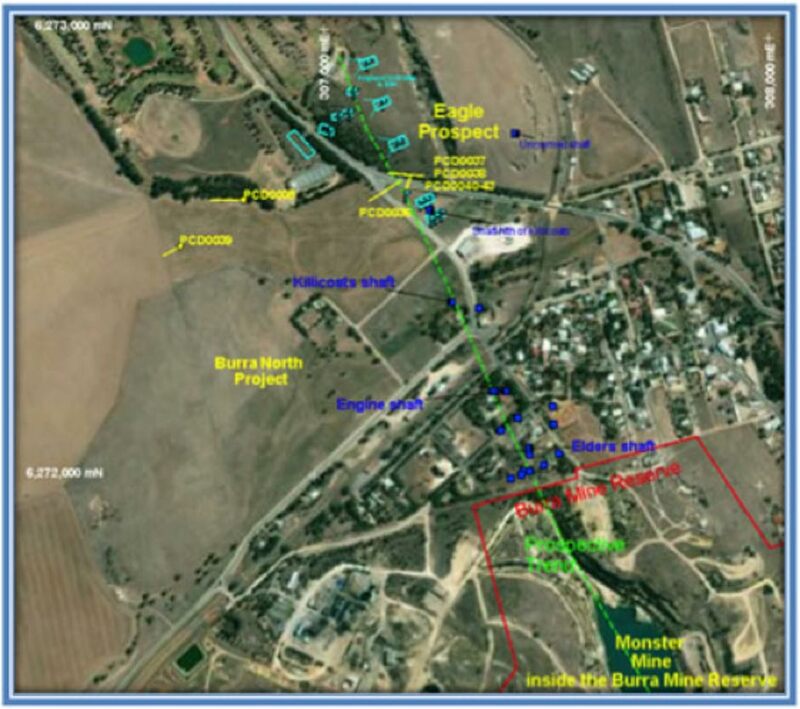 The Company has used historic Induced Polarisation (IP) data to define up to six target areas immediately along strike to the north and south of the historic Monster Mine. 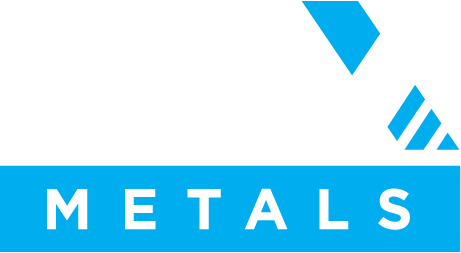 High-grade, near-surface copper sulphide mineralisation was intercepted at the Eagle Prospect (one of the northern IP targets) in an initial 2012 diamond drilling program. A soils anomaly was defined at the Condor prospect coincident with an IP target, immediately along strike and to the south of the Monster Mine, this target has not yet been drill tested. 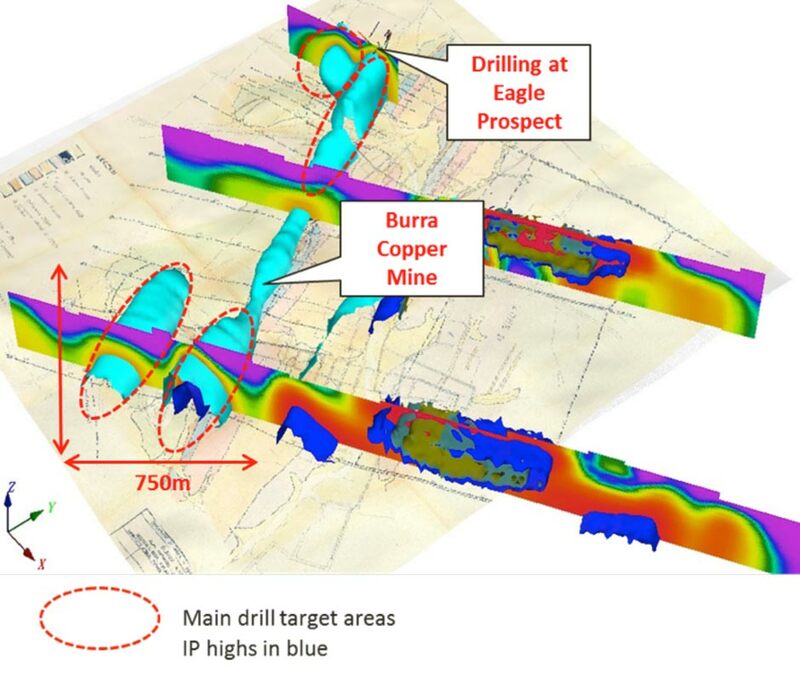 The Burra project has the potential to host a significant copper deposit, and the broader Burra region is prospective also for gold and other base metals. 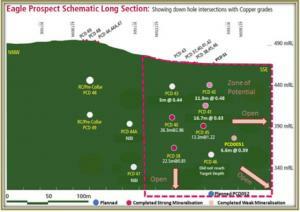 Phase 2 exploration drilling continued at the Eagle Prospect in September 2012 with the aim of better defining the zone of high grade copper mineralisation intercepted earlier in 2012. The zone remains open to the SSE and at depth. 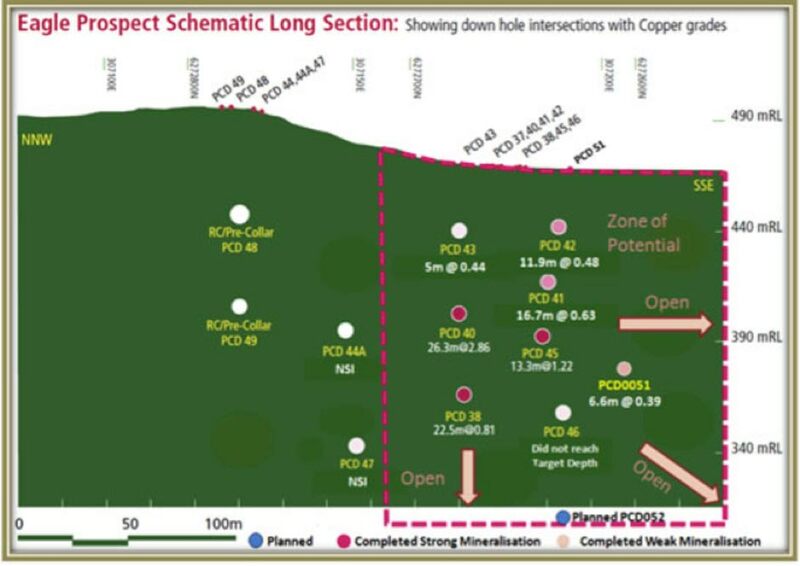 Figure 1 – Eagle Prospect Schematic Long Section – It is evident from the drilling to date and the reprocessed IP data that the high-grade copper drill intercepts at the Eagle prospect are all located close to the surface and in the northern portion of a north-west trending IP high approximately 600m in length, as shown below in Figure 2. 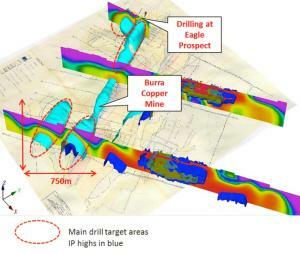 Figure 2 – 3D image viewed from the southeast to the northwest with IP response displayed – A number of new similar sized untested targets have been identified from the IP data, all of which warrant follow up drill testing (subject to prioritization), and all having potential for mineralisation similar to that intercepted at the Eagle Prospect.